Protoclassic Period, 100 B.C. to A.D. 250. 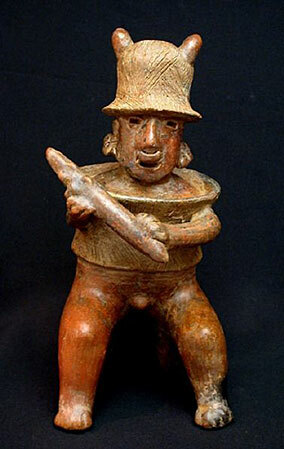 This warrior, seated on a three-legged stool, holding a knopped club in both hands, has deeply slit eyes and mouth, wears barrel armor and double-horned helmet, both incised with linear patterns. He is adorned with finely detailed earrings and nose ring, and is painted overall in a reddish-brown with black resist decorations. Provenance: Formerly in an old Los Angeles collection of ancient West Mexican art formed by a Dr. Richland. Aside from three tiny surface abrasions and some mottled manganese oxide deposits, this warrior is in excellent condition.